Day 2 of the 30 Paintings in 30 Days challenge and I am still going strong. I gather toward the middle of the challenge, it gets tough to keep it going. Today's image has the alliterative title of - "Popcorn and Peppermints". I loved painting the bright yellow and reds of the bad and peppermints. It was fun creating the soft focus popcorn inside the back compared to the in focus popcorn. With the reflections of the mints on the shiny surface everything fell into place. It looks good enough to eat! 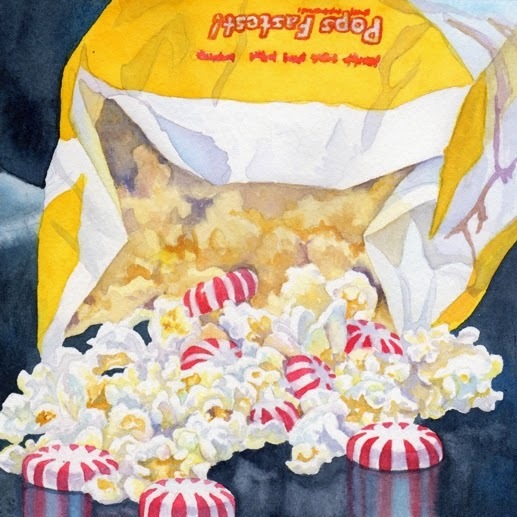 Popcorn and Peppermints is a 6" x 6" watercolor that is available for purchase on my Daily Paintworks site for $150 (framed) - Click here to purchase. This is a really fun painting. I love the subject! Thanks Lillian. I enjoyed painting 'Popcorn Peppermints" because of the bright colors and the fact that it is an unusual subject.